Shevet Shemesh, the Israel Scouts of Arizona, held an initiation ceremony at the Lost Dog Wash Trail in Scottsdale. About 75 children and their families attended the event. 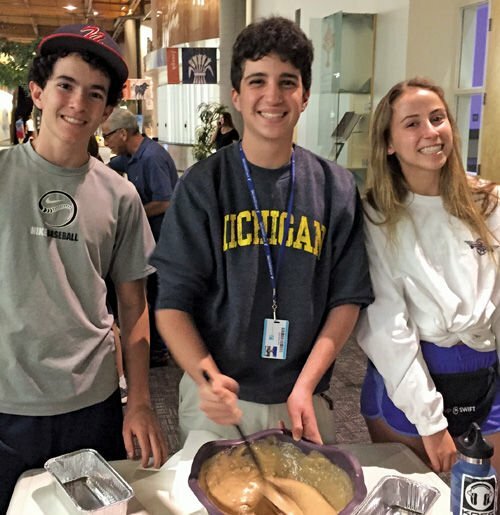 Students at the Bureau of Jewish Education’s Hebrew High make honey cake for Rosh Hashanah. Members of Frankfurter BBYO enjoy a recent chapter event. Jewish Youth Group Sports League – known as “The League” – and Team Phoenix Maccabi will host its first community kickball tournament for teens 6:45-10 p.m. Saturday, Nov. 5, at the Valley of the Sun Jewish Community Center, 12701 N. Scottsdale Road, Scottsdale. The Saturday night event will have two events – teens in grades 9-12 will play on the soccer field and grades 7-8 will play on the indoor basketball court. The tournament is in partnership with BBYO, NCSY, NFTY and USY. Cost is $10 for VOSJCC members and $15 for nonmembers. For more information, call 480-481-7016 or email sports@vosjcc.org. Register by Oct. 26 at vosjcc.org/kickball. Here is a roundup of upcoming events for Valley teens. The Jewish Community Foundation’s B’nai Tzedek Youth Philanthropy Program will hold a fall event 1-3 p.m. Sunday, Nov. 6, at the Ina Levine Jewish Community Campus, 12701 N. Scottsdale Road, Scottsdale. Teens in grades 7-10 will learn about leadership, philanthropy and community service. To register, contact Andrea Cohen by Nov. 2, ahcohen@jcfphoenix.org or 480-699-1717. The Bureau of Jewish Education’s Hebrew High will hold a five-week session of Krav Maga, a self-defense system for the Israel Defense Forces, beginning Tuesday, Nov. 1. The third annual Kurt and Gerda Klein Holocaust Education Forum for Teens will be held 8:15 a.m.-12:15 p.m. Friday, Nov. 11 (Veterans Day) at the Ina Levine Jewish Community Campus, 12701 N. Scottsdale Road, Scottsdale. The free program is for high school juniors and seniors and will address lessons of the Holocaust and include an opportunity to meet with Holocaust survivors. The forum is in partnership with Generations After, the Phoenix Holocaust Survivors’ Association, Arizona Council for the Social Studies and Arizona Council for History Education. Each participant will receive a T-shirt. This winter, Dec. 25-30, Hebrew High will hold a Winter Care-a-Van, a weeklong trip to southern California with volunteer opportunities and exploration of Jewish values and communities. Visit bjephoenix.org for more on these programs. 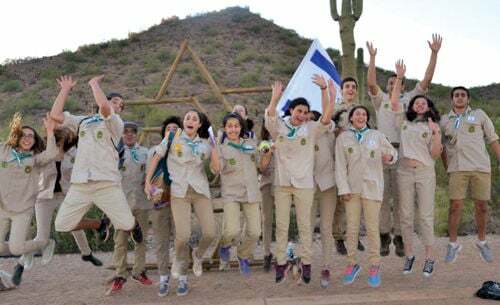 About 75 children and their families attended an initiation ceremony to welcome them to Shevet Shemesh, the Arizona chapter of the Israeli Scouts. The children hiked for two hours at the Lost Dog Wash Trail in Scottsdale then received their colored ties, which represent their age groups. On Nov. 4, the group’s 20 teen counselors will head to California to be part of a nationwide scouts leadership program seminar. Jewish Student Union (JSU) will hold a Sukkot Limo-palooza Sunday, Oct. 23, for students from Valley high schools. The event includes a barbecue lunch in the sukkah and a stop at Top Golf. Drop-off and pick-up will be from the Valley of the Sun Jewish Community Center, 12701 N. Scottsdale Road, Scottsdsale. JCC for members of Jewish youth groups (BBYO, NCSY, NFTY and USY). All teens are welcome to come watch the games. The League is funded, in part, by a grant from the Jewish Community Foundation of Greater Phoenix. Contact Alexa Wollach, alexaw@vosjcc.org or 480-483-7121. See the schedule at quickscores.com/vosjcc. TCTY (Temple Chai Temple Youth) will watch a daytime scary movie on Oct. 30 and make cookie jars to sell at Temple Chai’s Nov. 20 vendor fair and will join other Valley Reform synagogues for the NFTY-Phoenix Lock-In at Temple Solel on Nov. 19. Email ewynn@templechai.com. Jr. and Sr. USYers are invited to “Tie Dye Trivia and Treats,” 12:30-3 p.m. Sunday, Oct. 23, at Congregation Or Tzion, 9096 E. Bahia Drive, Suite 106, Scottsdale. Cost is $12 in advance or $15 on the day of the event. Register at tinyurl.com/usyTTT.